Time to show you my Mani of the Week! This week I went with Rescue Beauty Lounge Recycle. This deep forest green intrigued me from the very first moment I laid eyes on it. I love the creamy texture -- it just wouldn't be the same with sparkle. 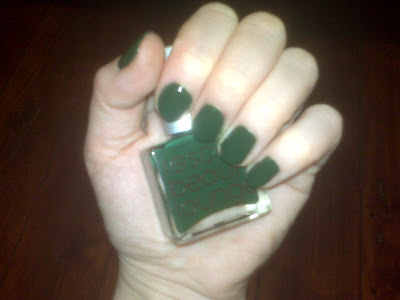 And there's just something so chic about a dark green nail polish, isn't there? What nail polish are you wearing this week? Let me know in the comments! Very nice! I'm wearing a green too... OPI Jade is the New Black. This green shade is really awesome. Thanks for the post.